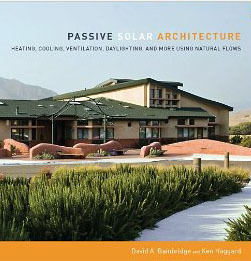 Here is a hefty book with a lengthy title: Passive Solar Architecture: Heating, Cooling, Ventilation, Daylighting and More Using Natural Flows. Written by two veterans of the Passive Solar movement, David Bainbridge and Ken Haggard, this book actually exceeds the promise of the title; it covers everything mentioned plus quite a bit more. Published in 2011, it is entirely current and relevant to our changing times regarding economic and ecological realities. For the authors “passive architecture” is an umbrella term that includes all dimensions of sustainability in the built environment. They say that, “For human survival and a livable future, the idea and application of sustainability must become part of an epochal cultural shift.” They do their best to nudge this shift along with the publication of this book. According to the authors, “The failure of the current worldwide economic system is in large part a failure of accounting.” To address this failure, they advocate focusing on triple-bottom-line accounting which includes ecology, economy, and social equity. With this perspective all life-cycle costs over the service life of a building are taken into consideration, including all health and environmental costs. This book is far from being just theoretical; they very quickly delve into the details of how to achieve a truly energy efficient building. Starting with how a building is situated in place and what materials choices are best, considering the microclimate of that place. The importance of exposure to sun and wind are fully investigated. Human comfort is critical to their thinking, and they make an excellent case that passive approaches to heating, cooling, and lighting yield greater comfort. The conventional approach to providing heating and cooling during the era of cheap energy has been to simply leave this aspect of design up to a mechanical engineer, who would calculate the appropriate size and placement of an HVAC system. We can no longer afford to design buildings this way. are provided for both residential and larger scale projects. They stress the importance of finding just the right balance among all of the elements of a passive solar design. It is rare that architects pay attention to ways to cool and ventilate a building using natural systems of air flow and thermal dynamics, but it is amazing how well this approach can work. This book analyzes strategies for using night time ventilation and radiation and evaporative cooling, as well as landscaping and green roofs or roof ponds. Wind catchers are an ancient way to help cool interior space. Carefully planned use of natural day light can help save energy, keep space cooler, and make occupants more comfortable and productive. This is another aspect of architecture that has been largely neglected, but must be considered as we become more aware of how to live holistically. An entire chapter is devoted to ways of accomplishing passive lighting that are effective and aesthetically pleasing. A survey of on-site resources that can be utilized include opportunities for providing solar hot water, the production of electricity, rainwater collection, gray-water use, and the useful processing of human waste. All of these strategies are examined in some detail. This book evaluates green materials and why to use them, both at the time of construction and at the end of the useful life of a building. This includes using recycled materials. This book represents a valiant effort to comprehensively explore all aspects of sustainable architecture, and I commend the authors on an excellent job of doing just that. The only fault I noticed is that they fail to mention the value of earth-sheltering as a way to enhance all aspects of thermal performance in a building. This book is lavishly illustrated in color with photos, diagrams and charts on practically every page. It would make an excellent text book, and I’m sure that the authors realize this since both of them are teachers. The final chapters are a series of essays on integrated design by the authors and a selection of other experts. They say that, “the key to success with this integrated approach to environmental design is achieving synergy. Synergy happens where and when the whole becomes greater than the sum of its parts, and the parts become optimized in relationship to the whole.” Let’s hope that we can all achieve such synergy as a collection of societies living on Earth. Great post! Appropriate building technologies are an overall part of passive solar architecture. Passive solutions in architecture should be one of the first things every architect should address.